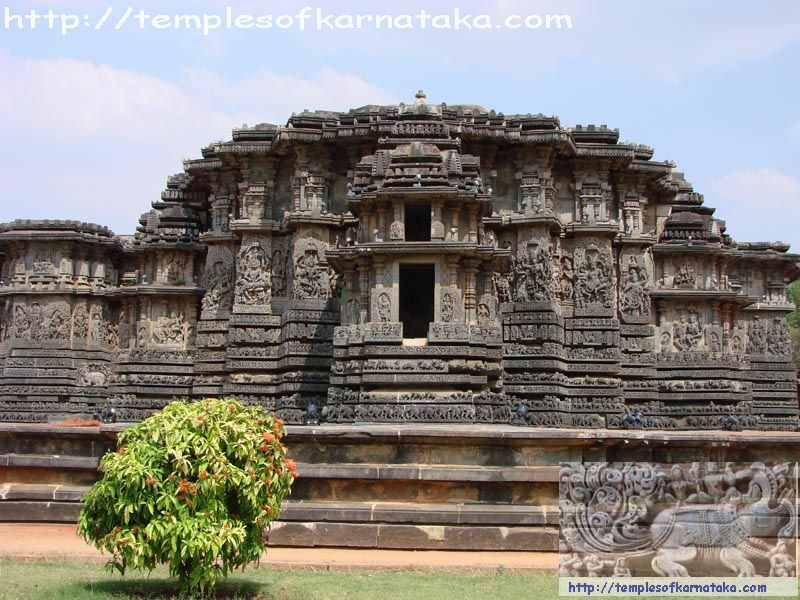 The temple is a Dvikuta (meaning temple with two Vimana/Gopura) dedicated to Hoysaleshwara and Shantaleshwara. In front of the temple there are two Nandi Mantapas which are very beautifully carved and attracts ones attention immediately. The temple is facing East direction and there are four entrances one on the North, one on the South and two from the East. If one enters from the Northern Door, one can find beautiful carvings of Dwarapalakas of Lord Shiva, at the entrance of the door richly decorated with ornaments and weapons. On the top of the entrance one can find carvings of Makara which is a mystical animal composed of Peacock, Elephant, Lion, Pig and Crocodile. As we enter the temple, you stand in front of Shantaleshwara deity who is in the form of a Shiva Linga and Navaranga under which you are standing is filled with minute details and takes a keen eye to understand more about it. Again the Dwarapalakas are carved with great amount of details and you need to start observing each part of the structure right from Crown till the foot. This part of the temple is lit from both the entrances and it would be advisable to sit down in the Navaranga and start looking onto the roof to find the Astadik Palakas. As we proceed further, one can see the long passage covered with various kinds of pillars and perforated screen onto the right. Again the ceiling is filled with details (would be explaining more about it shortly). Please note, this is the only place where there is passage between two kuta, normally they are closed in most of the other temples. As we approach the Hoysaleshwara the main deity, it is stunningly amazing to look at such impressive Shiva in the form of a Linga nicely decorated with jewels and ornaments and dashing back drape. Even here one can view the details of the Dwarapalakas and enjoy the ceiling viewing at the Mandakini's present in the Navaranga Mantapas. Great attention needs to provided while watching the interiors of the temple, please have the extra patience to enjoy minute details of the temple which is richly decorated with perforated walls facing east and all kinds/sizes of pillars present inside the temple. As we head out of the temple thru the South entrance, it�s time to go thru the Pradakshina Patha (Pedestal elevated at about 3 feet from Ground). One can find numerous of images dedicated to Ganesha, Vishnu Avatar, Shiva, Parvathi, Lakshmi, Brahma, and Saraswati. Along with the images of the Gods running above the railings, one can find greater details of Ramayana, Bhagavatha, Mahabharatha and instances of Bhakta Pralhada which are nicely carved. It atleast takes 2 hours or more to understand stories behind each scene being depicted over there. Knowledge of Mahabharatha & Ramayana along with Hindu Gods, their avatars (forms) would be crucial to understand the workmanship exhibited on the outer walls. There are six railings before the wall images are present. The first railing has Elephants present surrounding the entire temple, the second railing consists of Mystic Lion which is exhibited in many postures. The third railing consists of Cavalry forces with men and horses dressed in war attire, the fourth railing consists of Makara which is a mystical animal as explained earlier, and the sixth railing consists of Swans which hold set of beads in their beaks. Above the sixth railing the seventh railing consists of Wall images of all Hindu Gods and Goddesses. Atleast three pradakshina is required to carefully look around the temple. The complete mythical stories of Mahabharatha and Ramayana are very explained along with other Upa kathe which happened during ancient times. Upon reaching the Northern Entrance, the decoration changes from Wall images to small images of Courtesans, musicians, drummers, etc., and great amount of detailing can be found here too. The reason for not having wall images over here, is the presence of perforated screens which are used for ventilation and lighting purposes. The two Nandi each present in front of Hoysaleshwara and Shanthaleshwara is carefully carved with great precision and all the detailing are worth inside the Nandi Mantapas. After watching the temple both inside and outside, the best view of the temple would be from the West Direction where one can get enormous details of the Wall images. Also a view from Southern End gives you nice shot. Also a museum is present in the North East Direction, where one can find good collection of Hoysala Art, books are also sold related to other Heritage sites as well. One can spend good amount of time in this museum for which you have to pay a small amount of entrance fees. 1.Road from Bangalore to Halebeedu is well connected via NH 48 upto Hassan and then by State Highway upto Belur and Major District Road from there on. 2.The direct road which connects Hassan to Halebeedu is a MDR, enroute one can visit Adagur. 1. Alight at Hassan Junction(Connecting Mangalore, Mysore, Arsikere) and take the bus. 2. Alight at Arsikere Junction (Connecting Chennai , Bangalore & Mumbai line) and proceed by bus via Jaavagal. 2. Mangalore Domestic Airport, Bajpe. Travel by bus/taxi to Mangalore and then by Railway(5hrs) or Road(4hrs) to Hassan. Restaurant : Food is available near the Sri.Hoysaleshwara temple, but if you are very specific, you need to carry it from either Hassan or Chikmagalur. Hotel: Just opposite to the Sri.Hoysaleshwara Temple, you can find hotels to stay, but it is more advisable to stay in Hassan as there are good hotels/lodges to stay. Also, Hotel Hassan Ashok is very good and comfortable place to stay and explore Hoysala temples in and around Hassan. Transportation: Autorickshaws are available to go around Halebeedu, it is also well connected by buses plying from Belur, Hassan and Chikmagalur. Fuel Station: Fuel Stations are available at Halebeedu, but it would be always better to have reserve fuel to drive back to either to Hassan or Chikmagalur or atleast till Belur(18kms). Health Care: Primary Health Care Center is available in Halebeedu for immediate medical attention, but for any further treatment, it is advisable to reach Government Hospitals either at Belur, Hassan or Chikmagalur..